You probably know Sarsaparilla best as a sweet soft drink, but did you know Sarsaparilla is thought to have many medicinal properties and used to be drunk as a curative tonic? Sarsaparilla is a vine, native to the rainforests of Central and South America. The root of the plant is the most valued part of the plant, and the part used for its medicinal benefits. 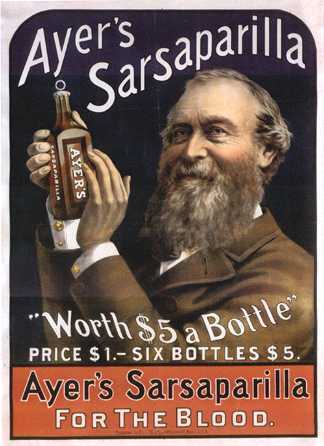 Sarsaparilla was brought to Europe from the Americas in the mid-sixteenth century where it quickly became popular with physicians and the public. Today, Sarsaparilla is most often used for its anti-inflammatory properties, which make it a great treatment for sufferers of skin problems such as psoriasis, eczema and itchiness. Sarsparilla has also been used in the past to treat a variety of conditions, including gout, arthritis, rheumatism, impotence, depression, syphilis and some symptoms of the menopause. The root of the Sarsaparilla plant is very bitter, and so it was common for pharmacists to distill the useful chemicals from the plant and then to mix these with sugar and water. This tonic would often contain ingredients such as liquorice, cassia, ginger, cloves, coriander seeds, sassafras and wintergreen. Sarsaparilla was one of G. Baldwin & Co’s most popular remedies, where they used to serve it strong and frothy, and very different to the sweet carbonated drink Sarsaparilla is today! Did you ever try a glass of Baldwin’s Sarsaparilla? Today the anti-inflammatory action is still much in demand for treating arthritis and skin disorders like eczema and psoriasis, and supplements of the plant are still on sale in Baldwins today. Previous postHerb Gardening at Art in the Park Next postBath Bombs & The Medical Herbalist! In the late 1940s I travelled regularly by bus along Walworth Road,noticed the “Sarsaparilla” sign outside Baldwins and wondered what on earth it was – the only thing I knew was that in a weekly radio programme, somebody (Tommy Handley?) always called out “Sarsaparilla – large lumps!” So I was interested to learn more about it. Is it still sold in large lumps? Whether the Southwark Pensioners’ Centre should be pushing this and other so-called herbal remedies as if they were of proven therapeutic value, providing Baldwins and others with valuable free publicity, is another question. Thanks for your memory Tony! Not sure about Sarsaparilla lumps…. Does anyone else know? In the late 50s early 60s me and my dad would walk from Camberwell to Baldwins nearly every Saturday morning. we’d have a pint of Sarsaparilla spend ages just looking around. it was like an Aladdins cave.i never tired of our trip. then we would walk home again sucking on a liquorice root. my lovely niece sent me some a few weeks ago and as soon as i sipped that sarsaparilla i was 10 again. it was just what i needed. Sounds really lovely, Lyn. Thank you for sharing your memories. Just had a lovely comment sent in by Frederick Roll. Thanks! When they were born, both my first two sons suffered badly with eczema which developed into asthma. They had all the usual checks and had to visit St Marys hospital over near Paddington, quite a trip at the time as we had moved out of south London into north Essex. They had the “exclusion” diet, starting with virtually water and potatoes and then add one item a day and if there was a reaction go back a week on the menu. They even reacted to the soya milk substitute perscribed by the hospital. We found out that virtually the only thing they could drink was sarsaparilla, so regular visits were made to Baldwins to buy the concentrate (and maybe have a drink in the shop while there!) When we told the doctor/nurse at the hospital they had never heard of sarsaparilla!!! In 2008 the Rotherhithe artist Ed Gray and his Swedish wife Ingrid were on a painting world tour, and I visited them during their stay in Oaxaca, a town in southern Mexico. When I got there they had already been there some time and had become accustomed to the culture and way of life there. One day, while Ed was painting, Ingrid said she wanted to take me to a place where they sell a drink that all the locals said was good for health and that they all drank regularly. I can’t remember its native name but I remember it translated as The Flower of Hibiscus. We walked out of the main part of town until we were in the backstreets and came across this little cantina where Ingrid ordered our drink. I was very excited as I love to discover local traditions and customs for myself. Our mugs arrived and I lifted it to my lips for my first taste: ‘This is sarsaparilla,’ I cried. “I’ve been drinking this in Baldwin’s since I was a kid!’ I was amazed, as was Ingrid. On my return I did some quick research to find that the Mexican health-giving drink was the very same as what Baldwin’s had been supplying to the community for years and years. Wow, how interesting! Thanks for sharing Michael. In the art class we made some paintings of the decorative bottles. Sarsaparilla, the word itself brings back very happy memories of my younger days living in Haggerston Which is in Shoreditch (Now Hackney) North London. After trips to the Odean cinema at Dalston on Saturday morning we would make our way along Kingsland Road market (The Waste ) for our apple fritters and sarsaparilla drink. At that time there was two drink stalls along the Waste, Tubbys run by a large older lady and Jim Cronys which was on the corner of Richmond Road, and many happy times were spent standing by the stalls drinking the delicious black brew. A further coincidence is that Jim Cronys was owned and run, but only on a Sunday in Brick Lane by a lady who I new as Aunt Nell, now I am not sure if she was actually related to my family as most older men and women who were friends of the family in those days were called Aunt this or Uncle that, but that did not bother me as trips down the Lane on Sunday morning always included a FREE drink for me from Aunt Nell. We also used to buy a bottle of sarsaparilla cordial to take home, but we could never create the same frothy effect as the drinks sold on the stall, even by trying to part block the tap flow to get a fast squirt into the glass. Those were more simple days and with today’s health and safety rules would probably not be allowed now, but it is today’s loss as far as I am concerned, Happy days. So pleased that you got around to adding your memories, John, and it’s great to have some East London stories here too. Those apple fritters sound good – not heard that before. I remember drinking saspirella as a little girl. My sisters and I loved it and we also enjoyed dandelion and burdock. You can still buy Sarsaparilla my local Tesco sells it and you can get in online. Happy drinking. And you can still buy it in Baldwin’s. Cheers! Yes – many remember the dandelion and burdock. Have you found any Sarsaparilla in Cheshire yet? Thanks Johnny. Next time your over in South East London, you can definitely still get a glass! that are named sarsaparilla? as a child we bought it in stone jars once a week and i am sure it was called root beer in those days. Interested to hear your stone jars story. Where did you buy yours? We think it has always been called Sarsaparilla in the Walworth Road. Thanks for your memory, Bob. The shop still sells it by the glass! The Roots was a Southwark Pensioners Centre project, run in partnership with Julia Honess and funded by the Heritage Lottery Fund, about the story of Walworth Road-based G. Baldwin and Co. Working with volunteers from the local community, the project tells the story of Walworth Road based G. Baldwin & Co, one of the oldest and most established herbalists in London, and the many customers who have frequented the shop over its long history.